Ed Balls the Labour Shadow Chancellor has been visiting Rosehill library in Suffolk today presumably to help the Labour district council campaign in Ipswich. I fear that in Suffolk they [the county council] seem to be embracing this ideological desire to get public services out of the way entirely with a bit more relish than most people expected," he said. Most people who depend upon libraries would say 'I don't want it to be a lottery depending on whether people are willing to volunteer to keep them open. It may be that some close, but has anyone actually thought that we may open some libraries? However, should responses to the consultation prove disappointing, it is imperative that we make the necessary savings, meaning that we may have to close 29 libraries. 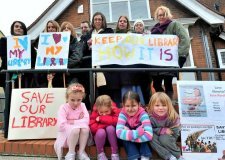 So why on earth would anyone reading this consultation think new libraries would be opened? Even if they were opened Suffolk have made it clear they don't want to run them so I do not understand the use of "we" here unless Cllr Terry is planning to run them personally?